3.In program mode, press pad bank c(in the program with the samples assigned) and press window button on the 1st pad so that you can copy the pad. 4. Copy pad c1 in the program to pad a1 in the empty newly created program. I was meticulous about making sure that i chose the new pgm to copy to. and kept getting the same result..
Hopefully this is clear enough... if not i;ll post link to vid..
Wow, now I don't know whether I should be happy or sad reading about all these bugs. Went through it page by page, re-considering whether I should trully order the unit since Akai is less likely to put more effort into fixing this at their own expense, without making any extra cash from it... Not like there is another JJ who will leave akai and re-program the OS for the 5k unit. JJ didn't program the 5k, so also less likely he'll make improvements on it as well. Really **** as I was looking for a bloody production centre to get away from the computer. Seems like the bugs are just too much. I now use a macbookpro 13inch with a mpc1000 with jjos and ni maschine.. Lent the 5000 to a mate.. Who uses flstudio.. Tryn to get him to convert over to hardware but i think i gave him the wrong unit..Should've gave him the 1000. Update the 5000.. Iron out the bugs... Stop the overflow of **** overpriced midi controllers and just stick to making well made hardware samplers. So anyone can replicate the copy pad from one pgm to another pgm pad bug? Are we ever going to get a new OS update? I think we can safely assume akai have stopped supporting this unit but have neglected to announce the news. Nearly a very nice machine but unreliable in a pro environment. Cant be trusted to not leave you apologising for the poorly implemented sampling sequencing beast. blackburst wrote: Are we ever going to get a new OS update? I think we can safely assume akai have stopped supporting this unit but have neglected to announce the news. Nearly a very nice machine but unreliable in a pro environment. Cant be trusted to not leave you apologising for the poorly implemented sampling sequencing beast. If you're expecting a new update, I guess you're **** out of luck. They seem to be more focused on their new hardware controller/software hybrid line of MPC-R's. Direct Record... I dont know if this a bug or not but it would be a cool feature expansion / improvement to existing feature. Direct Record is not much more that the sample function at this point. Can we make Direct Record automatically leave the sample in place in the sequence as a continuous sample? Or if not automatically can we be prompted to leave the directly recorded loop in place in the sequence or chop to new program after the loop comes back around to measure 1? Maybe after performing a direct recording of audio we can be prompted to go to the trim window and have an additional option in Trim for leave in place in the current sequence with whatever changes made in the trim section. This would be mad convenient for cats like me that have hardware and tend to resample everything back to the 5000. Please can someone who can accurately recreate the midi timing bug send me a PM? I would like someone to try an experiment and let me know their results. We are actually talking about this very subject in the JJ OS forum. Is the drifting you are talking about happens when two or more identical samplers are layered on a pad or triggered via SIMULT pad? pk204 wrote: Wow, now I don't know whether I should be happy or sad reading about all these bugs. Went through it page by page, re-considering whether I should trully order the unit since Akai is less likely to put more effort into fixing this at their own expense, without making any extra cash from it... Not like there is another JJ who will leave akai and re-program the OS for the 5k unit. JJ didn't program the 5k, so also less likely he'll make improvements on it as well. I'm not regretting the decision to buy 5000. even with all the bugs its one of the best machines on the market. I'm always bangin em out on this. you take the good you take the bad. Akai has as of late been working on an update but dont take anyone elses word for it. cop it use it and judge for yourself. i dont think you'll be disappointed. This is a forum of some really highend users so naturally they find bugs more often and they are vocal about it. had i listened to this forum before i got mines I would not have.... wait a minute i did get spooked from this forum and decided not to buy the 5000 but then my wife bought it for me on xmas just around the 2.0 OS release. I'm glad she did. no regrets. After reading some posts by Octobot, I'm hoping that the layer drifting isn't a case of the 5k(and all mpcs for that matter) using midi serial protocol per pad layering.. i.e. the four layers you trigger from one pad are actually four midi notes internally on the mpc. If that's the case the work around i guess is resampling. I COULD make the beat on 142, but I shouldn't have to. I checked the T.C. parameters, swing at 50%, strength 100, window 100. I played with them to see if it fixed it...nothing. Changed the polyphonic parameter between POLY/MONO, didn't fix it. I even tried different hi hats, but it affects ALL samples the same. It does the same thing regardless what BPM I set the track to. All of the other T.C. settings work fine, even 1/64(3), just not 1/64. 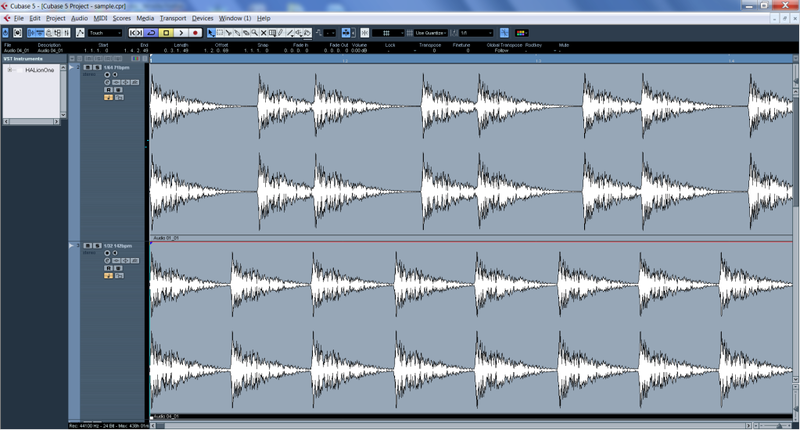 Here are what the waveforms look like in my DAW. The top track is the note repeat 1/64 at 71bpm (bad) and the bottom is 1/32 at 142bpm (good). You will see what I am talking about with the top track. They should both line up PERFECTLY with each other, but the top track has some sort of swing or shuffle to it, which it should not with 50% swing. Does anyone have a clue to what may be the problem or steps I could take? Any suggestions would be greatly appreciated and let me know if you need more info. If this is being discussed somewhere else and I missed it, please post a link. Thanks. kasper615 wrote: If this is being discussed somewhere else and I missed it, please post a link. Did you double post on Gearslutz too??? 1) LFOs are not free running when sync is off. 2) Random LFO Waveform's first value is no random value at all, meaning you can't trigger randomized modulation values on percussive samples.